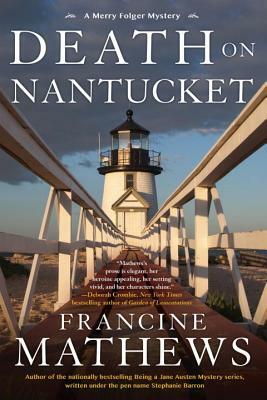 ​Francine Mathews' no-nonsense Nantucket police detective, Merry Folger, is back on the case after nineteen years. ​Death on Nantucket, the fifth Merry Folger Mystery, is full of regional charm, a strong sense of local history, and foggy New England Island atmosphere. Spencer Murphy is a national treasure. A famous Vietnam War correspondent who escaped captivity in Southeast Asia, he made a fortune off of his books and television appearances. But Spence is growing forgetful with age; he’s started to wander and even fails to come home one night. When a body is discovered at Step Above, the sprawling Murphy house near Steps Beach, Nantucket police detective Meredith Folger is called in to investigate. The timing couldn’t be worse: It’s the Fourth of July, and tourists are arriving in droves to celebrate on Nantucket’s beaches, so the police force is spread thin. On top of that Merry is planning her wedding to cranberry farmer Peter Mason, and her new boss, an ex-Chicago police chief with an aggressive management strategy, seems to be trying to force her to quit. Merry can’t conclude the Murphy investigation quickly enough for him. As she grapples with a family of unreliable storytellers—some incapable of recalling the past, and others determined that it never be known—she suspects that the truth may be forever out of reach, trapped in the failing brain of a man whose whole life may be a lie. Francine Mathews was born in Binghamton, New York, the last of six girls. She attended Princeton and Stanford Universities, where she studied history, before going on to work as an intelligence analyst at the CIA. She wrote her first book in 1992 and left the Agency a year later. Since then, she has written twenty-seven books, including four previous novels in the Merry Folger series (Death in the Off-Season, Death in Rough Water, Death in a Mood Indigo, and Death in a Cold Hard Light) as well as the nationally bestselling Being a Jane Austen mystery series, which she writes under the pen name Stephanie Barron. She lives and works in Denver, Colorado. "What a treat to have a new addition to one of my very favorite series! Francine Mathews's prose is elegant, her heroine appealing, her setting vivid, and her characters shine. For mystery lovers, the Merry Folger books hit every note." "Such a wonderful evocation of the island—breathtaking, quaint and sinister. Bravo, Francine Mathews." "An exceptionally smart mystery about long-buried family secrets . . . A literary vacation I couldn’t bear to see end." ​​"Death on Nantucket expertly balances an increasingly suspenseful mystery plot set within an imploding family, with the personal and professional challenges that pile up on Merry’s shoulders during one of the most intense periods of the year on the island. The sense of place in the novel is very strong, those who know Nantucket and those who dream of visiting it someday will love the armchair travel aspect of the story." "​The story is lovely and atmospheric, with a sinister crime to solve.​"
​"​If you like Anne Cleeves’ Shetland novels, you’ll love Death on Nantucket by Francine Mathews​. [An] ​accomplished traditional mystery​." "Mathews takes readers on a holiday tour with an ocean view, complete with a murder mystery as twisted as the emotions that family can evoke." "[A] twisty tale of family relationships gone bad." "A complex mystery involving secrets, a dysfunctional family, and Folger’s own insecurities." "This fifth in the Folger series and the first since 1998’s Death in a Cold Hard Light gives the resourceful cop plenty to deal with—not just the murder case, but also the busy Fourth of July holiday, a new and antagonistic boss, and her own impending wedding. It’s nice to see Folger back in action after a too-long hiatus." "A smoothly written, tightly plotted detective novel based on one of the classic mystery tropes: the death of a wealthy head of the family, with a circle of possible beneficiaries in the house. This is a great traditional mystery." ​"The pages just keep turning until you find out who did it and why.​"